1) Heat the broth and potatoes in a 3- quart saucepan over medium-high heat to a boil. 2) Reduce the heat to medium. Cover and cook for 10 minutes or until the potatoes are tender. Drain the potatoes well in a colander, reserving the broth. 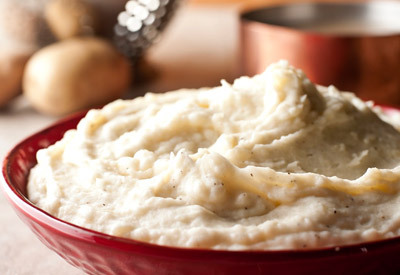 3) Mash the potatoes with 1/4 cup reserved broth, the cream, butter and black pepper. Add additional reserved broth, if needed, until desired consistency. Serve with the gravy.